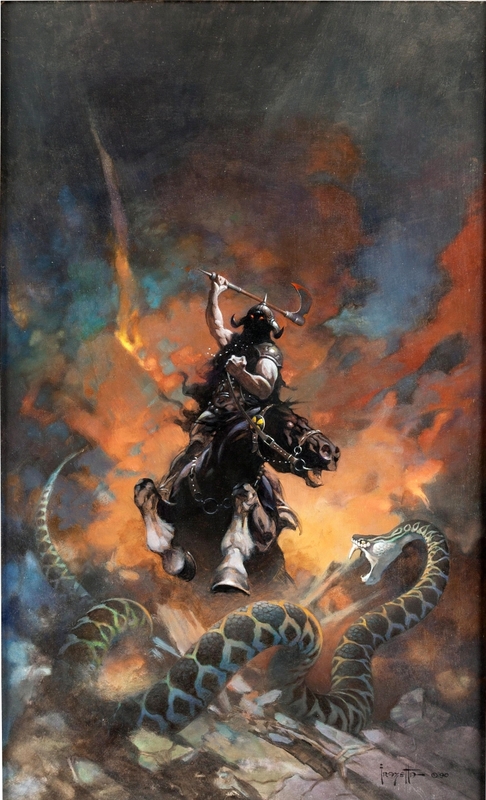 Frank Frazetta, “Death Dealer 6” painting, original art (1990), set a record when it realized $1,792,500. DALLAS – Sales of vintage comic books and comic art soared to a world record $58,544,323 in 2018 at Heritage Auctions. The auctioneers’ Comics & Comic Art Department recorded the highest sales totals in its 17-year history, representing the trend of high demand for original comic book artwork, rare comic books and animation art. The comics department also set new records for most valuable comics auction and most valuable piece of US comic book original artwork, with overall sell-through rate exceeding 99 percent both by dollar value and by lot. Last year’s sales represent a 32 percent increase over the department’s previous record, which was set in 2017. Among the records that fell in 2018 was Frank Frazetta’s original art, “Death Dealer 6,” 1990, published first as the cover for Verotik’s 1996 Death Dealer No. 2 comic book, when it brought $1,792,500 at Heritage’s Comics & Comic Art Auction May 10-12 in Chicago. That price nearly tripled the most ever paid at auction for a piece of US-published comic book art. Meanwhile, that auction’s total of $12,201,974 in realized sales also set a new world record for any individual comics auction. Original art by John Romita, Sr, and Frank Giacoia for The Amazing Spider-Man No. 100 cover drew bids from three dozen collectors before bringing $478,000, eclipsing auction estimates by nearly 20 percent and establishing a new world record for the most expensive Marvel Comics Silver or Bronze Age cover ever sold at a public auction. A new record for artwork by famed Disney artist Mary Blair was established when her “Cinderella Magic Coach Concept Painting” (Walt Disney, 1950) drew $60,000 in Heritage’s Animation Art auction June 16-17 in Dallas. A little over a month later, competitive bidding drove the final price for original art and a copy of Kaja Foglio’s “Magic: The Gathering: Arabian Nights ‘Shahrazad’ Card” (Wizards of the West Coast, 1993) to $72,000 in the July 22 Sunday Internet Comics, Animation & Art Auction, a record for any Heritage Weekly Comics auction lot. Animation art auctions were extremely strong in 2018. Heritage’s December 8-9 animation art auction brought in $1,956,926, making it the most successful animation art auction in the history of the company. The sale showed the growing global love of animation art and was highlighted by numerous record sales, including Disney, Hanna Barbera and Warner Brothers. Savvy collectors realized there was ample value to be had in Heritage’s weekly Sunday Internet Comics, Animation & Art auctions. The weekly evening sales, now frequently including lots that can produce five-figure prices, established a new record for total sales three different times during the year, including in the firm’s August 5 sale that yielded a record $466,512.20. The 936-lot auction’s top lot was Amazing Fantasy No. 15 (Marvel, 1962) CGC VG-3.5, which brought $20,400. For further information, www.ha.com or 877-437-4824.